They have endured a lot since this photo was taken. There are countless political prisoners in the world. We call them the “unjustly accused”, “prisoners of conscience”, and they’re everywhere. There are likely some in North American and European jails, too, lest we get too self-righteous. More commonly, though, “First World” inmates, even if wrongfully held, face punishments for minor crimes based on class or racial bias. A number of Canadians, one of my sons among them, make their warehoused fellow citizens a personal cause. I don’t. Nor do I devote much time to the, what, tens of thousands? hundreds of thousands? of souls locked up by tyrannical regimes simply because of opposition, real or paranoically imagined. As my mother-in-law says, pick only one or two lost causes to get behind. Because they’re Baha’is, and so am I. Global citizens, we in the Baha’i community are called to be. Lovers of humanity, and not simply of our own family, congregation, tribe or nation. But I can’t help it: I identify with these people because we share a spiritual choice, though our cultural backgrounds differ widely. Barely one in a thousand citizens of Earth belong to this community, and it is natural to stand up for your own. Necessary. Because there’s no other way to fight. 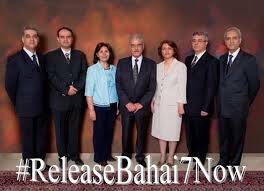 Baha’is don’t oppose their governments. MOHANDAS K. GANDHI, pithily, soul of wit-tily, but I’m not sure where or when.